Two games were organized, one between Miss Greenfern and Buttertub and another between Stacey and Milly. The distance around the field from hole to hole, or more technically speaking, “the round,” was fully a mile, and at the outset Milly, who was costumed for walking, and Stacey, who had taken silver cups as a sprinter, distanced the tightly laced Diana, and the loggy Buttertub. The caddy was beating the bushes in search of a quail, when suddenly over the gently rolling hill there appeared first a closed white umbrella, then a picturesque hat, and finally a manly form clothed in corduroys. The gentleman strolled directly toward them; he carried a Parisian sketch box, and was evidently an artist. “The Bayberry Bush + John Shippen and Beatrix Hoyt, after William Merritt Chase” (2012) by Carol Vantzelfden. Various stages and depot carriages bringing guests from New York, who had come down to see the tableaux, had driven by, leaving people at different cottages; but as yet there was no sign of either Adelaide or Mr. Waite. “Perhaps he has to drive around by the windmill to show her his studio,” suggested Milly. 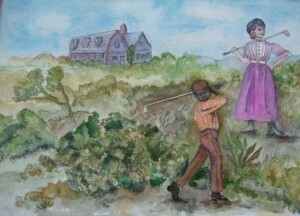 “He has had time enough to take in Shinnecock Inn and the Golf Club,” said Stacey. Both Winnie and Milly bowed, and Stacey lifted his hat; but the Van Noodens swept by with an unrecognizing stare. “They’ve cut us dead,” gasped Winnie, utterly astonished.